Naturally, I asked him what it’d been like to live through Pinochet’s coup and the fall of Allende. Naturally, he regarded me with an expression of utter boredom; then he said: ‘Like a Marx Brothers’ movie, but with corpses. Unimaginable pandemonium. If there’s one thing I hate the Communists for, Your Excellency,’ Fox a once said to Franco, ‘it’s for obliging me to join the Falange. All wars are full of stories that sound like fiction. All good tales are true tales, at least for those who read them, which is all that counts. Of course, if you ask, nobody was there when they torched the churches. Javier Cercas is a writer and, since 1989, a Professor of Spanish literature at the University of Girona, Spain. 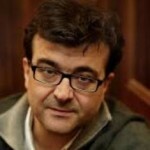 He is a frequent contributor to the Catalan edition of El País and the Sunday supplement. He worked for two years at the University of Illinois at Urbana-Champaign in the United States. He is one of a group of well-known Spanish novelists - which includes Julio Llamazares, Andrés Trapiello, Jesus Ferrero - who have published fiction in the vein of "historical memory", focusing on the Spanish Civil War and the Franco dictatorship.